Should You Eat An Artificial Sweetener That's Also An Insecticide? 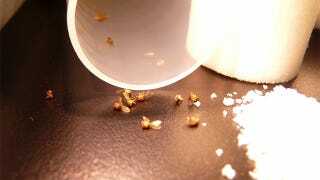 A new study has found that the popular artificial sweetener, Truvia, is toxic to flies. But we've been told not to worry — the active ingredient of this substance, which Coca-Cola uses as a sugar substitute, is apparently safe for human consumption. Indeed, it feels weird to be told that we can eat something that kills bugs. But erythritol, the main component of Truvia, and a naturally occurring sugar alcohol that's present in small amounts in many fruits, has been tested in humans at high doses and found safe to consume. It's considered a safe food additive by the U.S. Food and Drug Administration, and it has been since 2001. It has also been approved as a food additive in many other countries. Recently, during an examination of the effects of erythritol on the longevity of fruit flies (Drosophila melanogaster), Drexel University researchers discovered that it was toxic when ingested by the flies as compared to similar concentrations of nutritive sugar controls, like sucrose and syrup, and other artificial sweeteners. Flies exposed to erythritol lived for about six days, compared to their normal 45 to 60 day life expectancy. Strangely, the flies preferred erythritol over sugar. "Indeed what we found is that the main component of Truvia®, the sugar erythritol, appears to have pretty potent insecticidal activity in our flies," [Daniel] Marenda said. "We are not going to see the planet sprayed with erythritol and the chances for widespread crop application are slim," O'Donnell said. "But on a small scale, in places where insects will come to a bait, consume it and die, this could be huge." It should be pointed out that the researchers are pursuing a patent on erythritol as an insecticide and are continuing to study its effectiveness. "Our results demonstrate, for the first time, that erythritol may be used as a novel, environmentally sustainable and human safe approach for insect pest control," they write in their study. So, should you consume products sweetened by Truvia? Probably. But nutrition blogger Doub Robb is not convinced that the dose makes the poison. He says, "[If] I had to choose a calorie-free sweetener, I would choose stevia over Truvia; I would also advise all potential parents [i.e. pregnant women] to follow my lead." Read the entire study at PLoS One: "Erythritol, a Non-Nutritive Sugar Alcohol Sweetener and the Main Component of Truvia, Is a Palatable Ingested Insecticide."